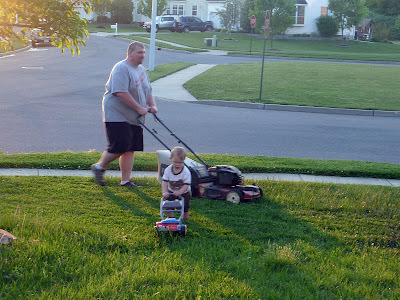 Daddy's biggest fan has decided that he also wants to be Daddy's big helper. I kid you not, this keeps him busy for an entire hour. He keeps an eye on Daddy to make sure that he turns in the opposite direction when he's supposed to and tries to time his moves to synch up with Daddy. 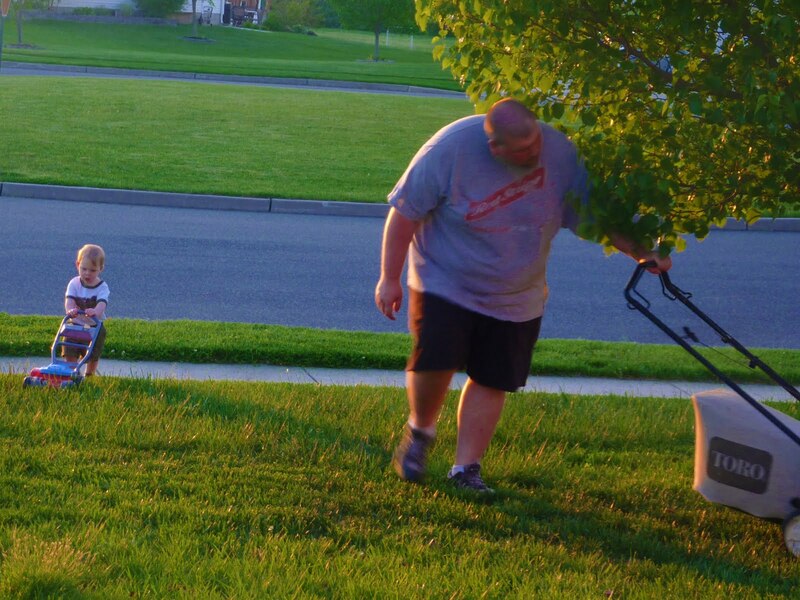 And he gets royally pissed off when Daddy takes a break to empty the mower bag. Ahh, this kid and his Daddy. His hero. His best friend. His pillow. While he increases the amount of words he says on a daily basis and has even moved onto phrases - most often we just hear: "Daddy, daddy, daddy! ", "That Daddy" or "Daddy, bread?" as he tries to shove his dinner bread into his Daddy's mouth. Of course, "Daddy" is followed closely by "Doggies" and "Katie." I'm somewhere down there on the list of importance. Way down there. But that's ok - Katie tells me she love me more than anyone in the whole world and that I'm her favorite ever. And don't forget to enter my giveaway for a signed Joanie Leeds CD, perfect for your favorite kid. Or you - if you're a dork like me. That is so cute! Madison LOVES to be out there when Daddy mows and we just bought her a little bubble mower so she can help out! What a cute post! Your kids are beautiful. I just found your blog through your giveaway on Twitter. I had a question - do you need separate entries to count the 5X entries for being a follower of your blog? I wasn't sure how you wanted it listed in the giveaway comments. No Lynette! Don't worry about it. I'll factor it in. Thanks for entering and good luck! We need to get together before he's not a baby anymore.